I have been taking photographs of the painted portions of parking lots for quite a while now (see Parking Lot Impasto; New Paint Job, Derelict Parking Lot, Parking Lot Square, Aging Parking Lot Segment) . Part of my fascination arises from the interesting textures, and patterns of the paint and its substrate, but also from the potential for design based on how the photograph is framed in the camera. Below, I try to recreate the photographic elements of texture and linear design of the parking lot patterns, with the tools available to me through watercolor painting. I used a variety of brush strokes to replicate texture; the rough surface of the paper itself; and juxtaposition of complementary colors for maximal contrast to create a plethora of naps and lines that could have been an interesting patch of parking lot. 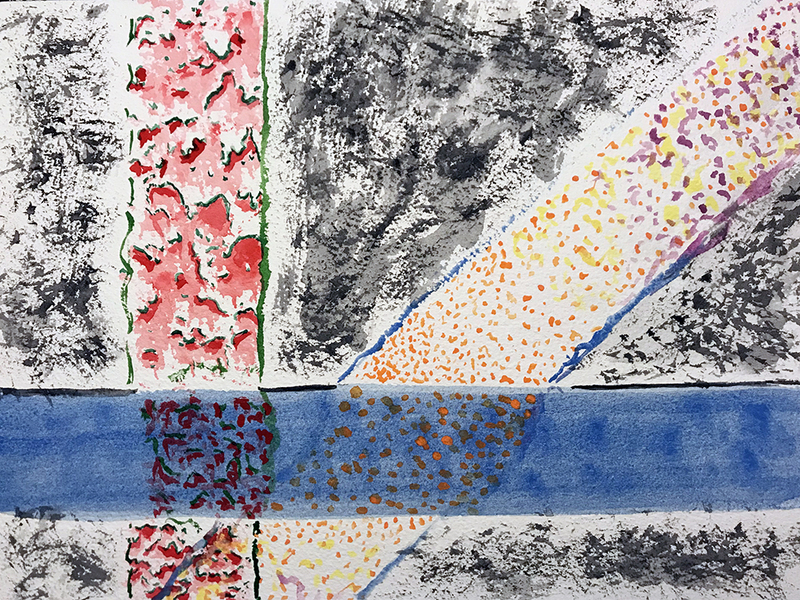 This entry was posted in Personal Stories and tagged abstract art, art, artistic process, creativity, painting, visual arts, visual elements, watercolor, watercolor techniques. Bookmark the permalink.